The Sun can be a better chemist, thanks to zinc oxide nanorod arrays grown on a graphene substrate and "decorated" with dots of cadmium sulphide. In the presence of solar radiation, this combination of zero and one-dimensional semiconductor structures with two-dimensional graphene is a great catalyst for many chemical reactions. 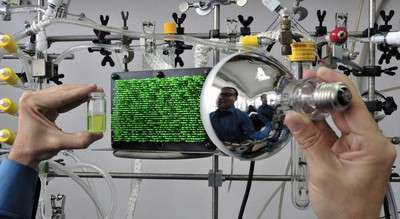 The innovative photocatalytic material has been developed by a group of scientists from the Institute of Physical Chemistry of the Polish Academy of Sciences in Warsaw and Fuzhou University in China. It's a strange forest. Simple, uniformly distributed trunks grow from a flat surface, rising long nanometres upwards to where crowns of semiconductors greedily capture every ray of Sun. That's the view seen through a microscope of the new photocatalytic material, developed by scientists from the Institute of Physical Chemistry of the Polish Academy of Sciences (IPC PAS) in Warsaw, Poland, and State Key Laboratory of Photocatalysis on Energy and Environment, College of Chemistry at Fuzhou University, China. 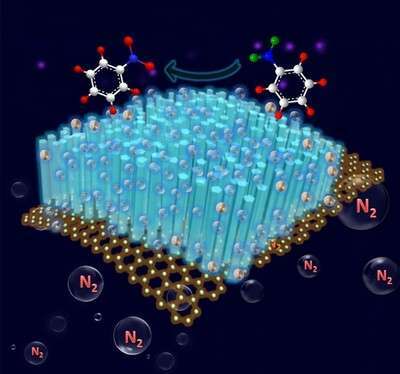 The novel 3D material has been designed so that during the processing of solar energy the best collaboration is achieved between the dots of cadmium sulphide (so-called zero-dimensional structures), the nanorods of zinc oxide (1D structures), and graphene (2D structures). The methods of converting light energy reaching the Earth from the Sun can be divided into two groups. In the photovoltaic group, photons are used for the direct generation of electrical energy. The photocatalytic approach is different: here radiation, both visible and ultraviolet, is used to activate chemical compounds and carry out reactions which store solar energy. In this manner it is possible to e.g. reduce CO2 to methanol, synthesize fuel or produce valuable organic intermediates for the chemical or pharmaceutical industry. The principle of operation of the new, three-dimensional photocatalyst, developed by the group from the IPC PAS and the University of Fuzhou, is simple. When a photon with the appropriate energy falls on the semiconductor - zinc oxide ZnO or cadmium sulphide CdS - an electron-hole pair forms. Under normal circumstances it would almost immediately recombine and the solar energy would be lost. However, in the new material electrons - released in both semiconductors as a result of interaction with the photons - quickly flow down along the nanorods to the graphene base, which is an excellent conductor. Recombination can not occur and the electrons can be used to create new chemical bonds and thus to synthesize new compounds. The actual chemical reaction takes place on the surface of the graphene, previously coated with the organic compounds which are to be processed. Zinc oxide only reacts with ultraviolet radiation, of which there is but a small percentage in sunlight. Therefore, researchers from the IPC PAS and Fuzhou University have also covered the nanorod forests with cadmium sulphide. This reacts primarily with visible light, of which there is approx. 10 times more than the ultraviolet - and this is the main supplier of electrons for the chemical reactions. "Our photocatalytic material operates with a high yield. We usually add it to the compounds being processed in a ratio of about 1:10. After exposure to solar radiation within no more than half an hour we process 80% and sometimes even more than 90% of the substrates," stresses Prof. Yi-Jun Xu (FRSC) of Fuzhou University, where the majority of the experiments have been carried out by the research team led by him. "The great advantage of our photocatalyst is the ease of its production," in turn notes Prof. Juan Carlos Colmenares of the IPC PAS. "Graphene suitable for applications in photochemistry is now available without any greater problems and is not expensive. 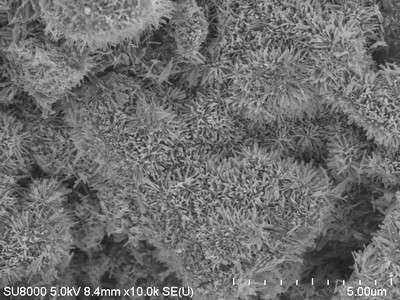 In turn, the process invented by us of coating graphene with plantations of zinc oxide nanorods, on which we subsequently deposit cadmium sulphide, is fast, efficient, takes place at a temperature just slightly higher than room temperature, at normal pressure, and does not require any sophisticated substrates." For application on a broader scale it is important that the new photocatalyst is consumed slowly. The experiments carried out to date show that only after the sixth-seventh use does a slight decrease of about 10% in the yield of the reaction occur. Skillfully used, the new 3D photocatalyst may significantly alter the course of chemical reactions. Its use, e.g. in the pharmaceutical industry, could reduce the number of stages of production of certain pharmacological compounds from a dozen to just a few.